The Hundred Thousand Kingdoms read along, part two! What would you do if you started hearing voices in your head? How about if those voices saved your life, and then helped you improve your life? You’d listen to them. . . right? The Lives of Tao follows a sort of Hero’s Journey (which I have a major weakness for), and so often in tales like this the protagonist is already hero material – they’re in good physical condition from page one, perhaps already have weapons and or military training, it’s almost as if that person has been planning their entire life about one day being called up for a Hero’s Journey. Not so with Roen Tan. He’s lazy, unambitious, in terribly physical condition, and has self esteem issues. He firmly lives in the same real world you and I inhabit – crappy job, annoying boss, messy apartment, and he lives on frozen meals. He’s the last guy in the world to buy into the fact that aliens have been among us for centuries, the last guy on Earth you’d want to invite on a Hero’s Journey. Can I tell you how refreshing that was? It was really freaking refreshing. Roen isn’t going crazy, but he is hearing voices. The alien Quasing have been among humanity for eons, riding along in our minds and bodies, helping to nudge humanity forward. They only want to get back home, and to do that, we’ve got to become a space faring race. Over the centuries though, factions have arisen, and the Quasing have split into the peaceful Prophus, and the more aggressive and warlike Genjix. They’ve inhabited many of our famous leaders and innovators, such as Ghengis Khan, Shakespeare, Cardinal Richelieu, how many people who influenced our culture and shaped history did so because they had a Quasing guiding them? Luckily for Roen, Tao is a Prophus. That doesn’t mean Roen’s life is going to be easy though. Tao needs to get back into the field, which means Roen’s got to clean up his life. No more frozen pot pies for him. Once Roen comes to terms with what’s happening, the pace of the book intensifies into an action packed and often humorous adventure, with Roen trying to catch up as fast as he can, and Tao reminding him that all those silly action moves from spy movies just don’t work in the real world. He trains with Sonya, learns martial arts from the secret master Wei Cheng Lin, and goes on covert missions, all while attempting to have a romantic relationship with a co-worker. On the surface, The Lives of Tao feels quite a bit like a blockbluster action movie – lots of car chases, secret training facilities, martial arts scenes, shooting out CCTVs with silenced guns and knocking security guards unconscious. But there’s plenty of layers underneath as well. The dialog for one, is flat out brilliant. Writing natural sounding dialog is not easy, and Chu pulls it off with effortless flair. Popculture references abound, with dues (and jokes) paid to superheroes, spy movies, and video games, with quite a few laugh out loud moments. Tao gives Roen a hard time, and Roen gives as good as he gets. Tao knows he’s an egomaniac and Roen knows he’d rather be at home playing video games. But they’ve got to come to some kind of agreement as they are stuck with each other until Roen grows old and dies. Or gets shot on a mission. Tao would never, ever admit it, but he needs Roen. I could listen to the two of them banter back and forth until the cows came home. Now that’s an interesting question. what happens with a Quasing host is too ill, injured, or aged to be of use? The only way to separate a Quasing from their human host is if the human dies. A related question is what options does the human host have if they are forced into a partnership with a Quasing? Chu doesn’t shy away from moral questions, giving some powerful emotional depth of a fun action story. I’ve been reading a lot of heavier stories lately, and The Lives of Tao was exactly what I needed: It was fun. Just straight up fun. The story mostly focuses on Roen being initiated into the world of the Quasing, so much of the history and secrets are touched on but not expanded. There is an entire side storyline about a new technology the Genjix are developing that would be a danger to everyone who knows about the Quasing. This novel is primarily introduction and set up for characters and technologies and missions that I’m sure will be more important in later novels. The second novel, The Deaths of Tao, is out now, with a third book forthcoming. My only issue with The Lives of Tao was with how the Genjix were portrayed. On the one hand, it’s interesting to get mostly only Tao’s point of view of the Genjix, because Tao may not be the most reliable person. On the other hand, the Genjix are your stereotypical overpowered cardboard badguys. They’ve got all the resources in the world, then go and spout super cheesy lines when one of their operatives can’t seem to capture Roen, it made the main villain look like an easily foilable James Bond badguy. One scene in particular reminded me of Darth Vader strangling one of his commanders and then congratulating the next guy on his sudden promotion. It was just cheesy, and didn’t at all match the naturalness of the scenes with Roen and Tan. I’m gonna chalk that up to debut novel stuff, and just not worry about it. If you’re looking for something fun that will make you think while making you chuckle, give The Lives of Tao a shot. 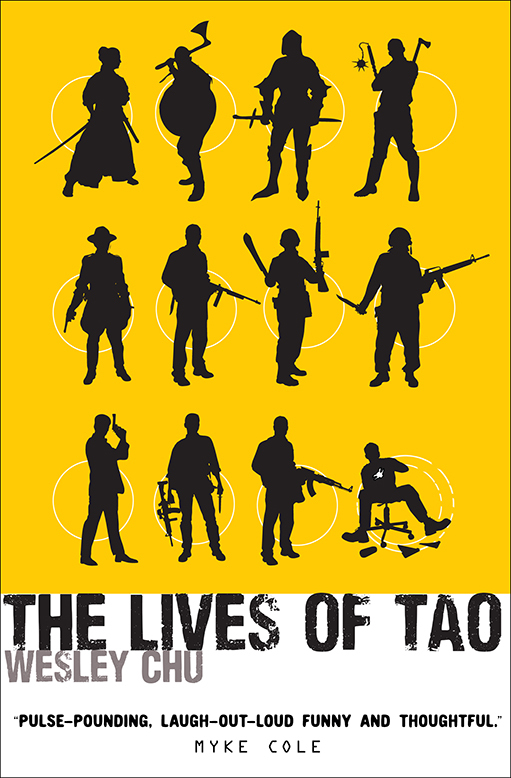 15 Responses to "The Lives of Tao, by Wesley Chu"
Alright, alright…you internet folks have convinced me! This is the second glowing review in the last few days. I’m snagging a copy of this today! It really does sound like fun. I see there is a sequel out as well. and a third one in the works!! 😀 I’m hoping to see Wesley Chu at a convention next year, I can be an adoring fan. I’m over half way through and am loving it. and Wow did I need something fun! The dialog had my laughing my head off, and even my husband is interested in reading this one. I’m sure we’ll pick up the next book in the series pretty soon. I have never heard of this. It sounds like something I will have to check out! Glad to see another positive review of this one! I love the Tao books (the second book is INTENSE. Like still really great, but not as light-hearted as the first). Okay, this just became a higher priority…..
I’m really looking forward to the second one. right after I finished this, i gave it to my other half and basically demanded he read it too. and he had a good time with it as well, so we’ll be fighting over the second one pretty soon! haha! Yeah I gave this one to my bestie’s husband telling him he’d love it. she doesn’t like sci fi by he gobbled it up! Fine. I’ll just add another book to the goddam tbr.